Reviews Coming at YA (*Kids Too*): Out This Week (Children's): APPLESAUCE WEATHER and HEY COACH! 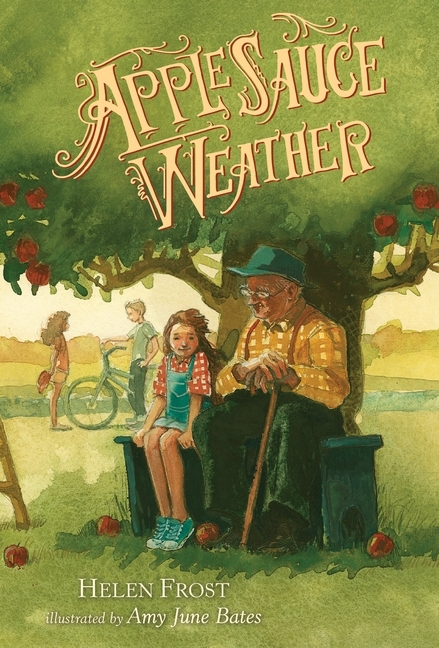 Out This Week (Children's): APPLESAUCE WEATHER and HEY COACH! For me, there is no better time than the Fall--that crisp air, the long shadows, and of course, the apples. In fact, I am headed up the Blue Ridge mountains this weekend to buy some early apples. For Faith, the first fallen apple from the tree in her yard signifies one event--applesauce weather. This is the time of year when Faith's Aunt Lucy and Uncle Arthur visit, and Aunt Lucy makes applesauce from the apples on the tree. Sadly, Aunt Lucy died the previously, and Uncle Arthur is still grieving. Still, when the first apple falls, Faith is sure Uncle Arthur will still visit. Her brother, Peter, is not convinced and teases her. Just like her name, Faith believes in her Uncle, and she is not surprised when his car pulls up in the yard. Written in verse, both rhyming and free, Frost creates a feeling of Fall that I have rarely read. Through the black and white illustrations by Bates, the reader can visualize Faith's eagerness as well as Uncle Arthur's sadness. Told from every character's point of view, Frost creates a portrait of loss but also love--one that is enduring and accountable. Having watched my little cousin play pee wee football and not know which way he was going (at first), I can totally see that same childlike innocence in these adorable boys and girls as they learn to play soccer. The Coach in this book is charged with teaching newcomers as they learn the ins and outs of playing soccer. Choosing a name (the Sparks), the Coach leads the children through several practices and games. While they start off shakily and confused, they soon grow to love the sport--but most of all, their coach. Smith's illustrations are diverse, showing every type of boy and girl and their eager, excited expressions. This is the perfect book for teaching children about learning how to play a sport and sticking with it. It is also great for adults who may be thinking about coaching. Much like teaching, being a coach is more than just being on the field or in the classroom. It's about being a mentor and helping children be the best they can be. What a great lesson to learn!